"Thirty-five years ago, a small group of committed, passionate, and young artists created the first Asian Pacific American theatre company in the country. Our goals were to help break down stereotypes of Asians, to preserve stories of our immigrant histories, to share the unique experiences of being Asian and American, and to make visible the significant achievements of Asian Americans on the landscape of America. "..message from Mako - founding artistic director of East West Players. What is the East West Players Theatre? East West Players (EWP), the nation's first and foremost Asian Pacific American Theatre, was founded in 1965 by nine individuals with the unprecedented idea of creating a home dedicated to promoting Asian Pacific American work and talent not available under Hollywood's limited opportunities for Asian Americans. EWP started with its nine founders and today works with over six hundred people annually. They perform for over 40,000 people per year. EWP. alumni have been nominated for Oscars, won Emmys, Tonys, Obies, Ovation Awards, LA Weekly Awards, Dramalogue Awards and many more. Over 75% of all Asian Pacific performers in the acting unions have worked with EWP. Artistic Directors Mako, Nobu McCarthy and current Artistic Director, Tim Dang, have operated out of a modest storefront facility on Santa Monica Boulevard, in Silver Lake. 1996 marks EWP's move into a larger facility at the Union Center for the Arts in downtown Los Angeles to provide programs that keep pace with the growth of the Asian American community in Los Angeles. When the curtain went up several months ago on a production of Stephen Sondheim's Pacific Overtures at the new home of East West Players in downtown Los Angeles, it marked another new chapter in the annals of this troupe, and, in a broader sense, the history of multicultural theater in the United States. East West Players is the oldest, and one of the most influential, Asian-American theater companies in the nation, with a three-decade-plus track record of affording Pacific Rim actors a place to practice their craft, hone their skills and gain insights into the business of acting. The troupe's success is "preceded by that of its alumni," Jan Breslauer wrote in the Los Angeles Times recently about this "invaluable nurturing ground." Actors Pat Morita, John Lone and Sab Shimono -- all of whom are well known in the U.S. film and television industry -- are among those who have passed through the company's doors, along with playwrights David Henry Hwang (who has had four of his plays staged there) and Philip Kan Gotanda. 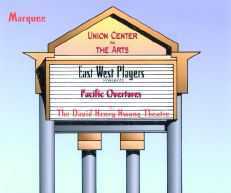 East West Players is now in residence in the 220-seat David Henry Hwang Theater in a former church, known today as the Union Center for the Arts, which also houses an art exhibitor and an independent film organization. Lead donors included Henry and Dorothy Hwang, parents of the playwright for whom the theater was named. Hwang, author of such Broadway dramas as M. Butterfly and Golden Child, is the most successful Asian-American playwright on the contemporary scene. The company's first artistic director was Mako, a familiar face as a character actor in a skein of Hollywood films who later starred in the original Broadway production of Pacific Overtures, Sondheim's 1976 musical depiction of the opening of Japan by the West in the 1850s. Mako recalls that he and his colleagues weren't "consciously working to establish a model" when they began to stage plays. "What we were trying to do, consciously, was to be honest with ourselves, learning to cope with elements that were surrounding us, such as racism and discrimination." Beulah Quo, another gifted Asian-American actress and an original East West player, recalls that in the beginning, "we were really the first group of Asian Americans working together in Los Angeles. That's common now. But in those days, people never thought of it." With the passage of three decades, East West Players reflects the themes of U.S. society from the identity politics of the Sixties and Seventies to more mainstream issues of life and love. The company, which inspired the creation of other Asian-American companies in the Seventies in the aftermath of its own success, also typifies the multicultural theater scene in the United States. It represents its constituency in the same manner as Hispanic-American theater in Los Angeles, New York City and elsewhere, and African-American theater in all parts of the country. And as with these other forms, Asian-American theater is flourishing. "The audiences are larger," Hwang said recently in The Washington Post. "It's more accessible. It's more visible than we would have thought 20 years ago. It's exciting, the way you'd be excited about seeing any child grow up." Tim Dang, the current artistic director, told The Daily Bruin, the University of California at Los Angeles newspaper, that he hopes the new site will evolve into an arts center rather than simply a theater. "I think that's one of our goals -- to have a cross- pollination of audiences, where hopefully the audiences that come to see the theater will come to the art exhibits as well, and if we have any film screenings, we will invite [patrons] to come see theater."